A Personal Survival Kit, or PSK, is a compact collection of tools and supplies kept in a small durable container for surviving whatever disaster its owner sees fit to prepare for. PSKs will vary greatly depending on what their owners see fit to prepare for. 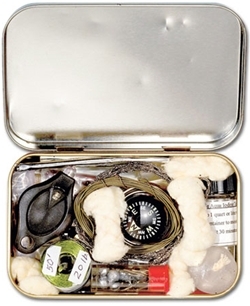 One of the most commons types of a PSK is the Bug Out Altoids Tin (BOAT), which is a tool set designed to fit inside of an Altoids tin or similar container. This page was last modified on 30 December 2013, at 11:04.